If this is it… | hear.here. The last couple of weeks has brought a couple of shows, some tentative singing, and a lot of listening. I find I seem to have reached the point where “new” is no longer happening very often and what I’m hearing is very stable. There doesn’t seem to be much growth or learning. At 9 months post-activation, I expect this is normal and this is now how I’m going to hear. There have been some really good moments. 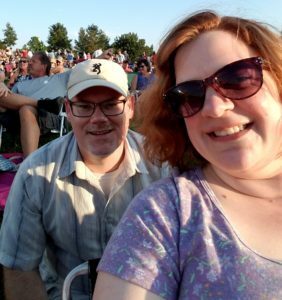 We went to go see Huey Lewis and the News in concert. An outdoor venue, I wasn’t expecting the greatest sound in the world, especially compared to some of the other shows I’ve been to recently. I was pleasantly surprised. I was able to recognize the hits easily and was able to enjoy the songs I didn’t know – even understanding a lot of the words. His voice was so clear, perfect, and inspiring. He makes me want to work on singing again. Jonathan was sitting behind me…and I could understand what he was saying! We ran into our friends Jonathan and Natalie at the show and I was able to have conversation with them, even while the music was going. At one point during the opening act, Jonathan sat behind me to have a conversation with Ed, who was sitting next to me – and shockingly, I was able to understand what he was saying! With my previous hearing, I probably wouldn’t have even been aware he was talking, and certainly wouldn’t have understood without turning around to lipread. That was pretty neat. Last week, I was encouraged by an old friend to really start working on my singing again – so I did some practice in some different ways to see what would work best for me. My old CDs of piano accompaniment for all of my old audition pieces were pulled out and I worked on those – most of those I can sing without thinking about it, especially the Italian arias. I didn’t have much trouble finding pitch with them, but I did feel like my own voice was overpowering at times and I could not hear the music. So I tried some karaoke pieces to see if they were any better, and they were a bit jumbled, but I could hear enough to do what I needed to do. Then I tried online karaoke using my headset, and that is by far the best hearing situation for me for singing – I can hear all of the music in both ears, it doesn’t sound jumbled, I can hear my own voice well but not over powering. So that’s definitely my preferred way to sing right now – I need to figure out how to take that and make it work in an environment without the headset. My second preferred environment is the car – I have always loved singing in the car because it contains all of the sound so well. I had a 6 hour road trip to Iowa City and then back over the weekend and had lots of time to work on this. I come back around to the question – if this is what my hearing is now and going forward is this good enough? I think the answer is yes because no matter what it’s 20x better than what it was. Is it perfect? No. It’s never going to be perfect. And I’m going to keep listening and doing rehab exercises and trying to make it better, but I think I can live with it if this is it. Pingback: An open letter to Huey Lewis from one who’s been there: singing after sudden hearing loss | hear.here.